Ever wondered just how fast a 3G, 4G LTE, or Edge network is on your iPhone or Android? Using a free app called Speed Test you can easily test and compare the mobile broadband speed of your smartphone (or cell equipped iPad) with others, whether they’re on AT&T, Sprint, Verizon, T-Mobile, or any other network. If you’ve been thinking about switching carriers when the new iPhone arrives, this is a great app to help you make such decisions. Have your friends with iPhones or Androids download the SpeedTest app on their device and check mobile broadband on their respective carrier networks, then compare the results to see if it makes sense to jump ship. The SpeedTest app isn’t specifically designed for comparing providers, so you’ll have to rely on your friends or family members with competing networks to run the test on their devices and either take a screenshot or just tell you their results. For the most accurate comparison, you’ll want to get a sample from various locations on different days from the general vicinity in which you use iPhone (or Android). Download the app and run it on your smartphone to determine what your download speeds are. Yes, you can test wi-fi speeds too, but this is generally most useful for testing the mobile broadband speeds of LTE and 3G networks. It’s important to remember a wide variety of things can impact data connectivity and transfer speeds, including the current location, signal strength, network capacity, and many other things you generally don’t have much control over. For example, in big cities it’s common to have really slow download speeds, but in rural areas with less burdened cell towers you can often get extremely fast data transfers. Then of course there’s Edge, which is usually so slow everywhere that it’s unusable for anything beyond checking email, or even worse, the “GPRS” network which identifies itself as a little circle icon in the status bar, which usually can’t transfer any data at all. If you are looking to get the most accurate results, be sure you have a full cell signal, or at least use the app for testing from a location you most commonly use your phone at, like home, the office, or school. For those who want the absolute most accurate data, take a moment to enable Field Test Mode on the iPhone so that you can see more accurate signal numbers rather than the bar indicators, that way you’ll know exactly how good the connection really is, and how that corresponds to the download speeds. You can also test the speed of your home broadband connection with the Flash-based SpeedTest.net, or by joining your local wifi network and running the app from home. With the exception of true 4G LTE, your home connection is almost certainly faster. Looks like your AT&T 3G speeds are about as erratic as mine. San Francisco = terrible service! I’d switch to Verizon but they are no better. Pretty sure neither are investing in 3G infrastructure here, though Verizon LTE is extremely fast for the time being. Telus in Northern British Columbia 3G 2.31 down and 2.51 up…. pretty consistent around there so now all that bad I guess. I have an Android Galaxy Nexus and a iPhone 4S. The iPhone is AT&T and the Android is on Verizon. Verizon bumped the speeds up around here (S. Il.) so I tested it along an iPhone on Verizon. I got nearly 30mbps down and 18mbps up. 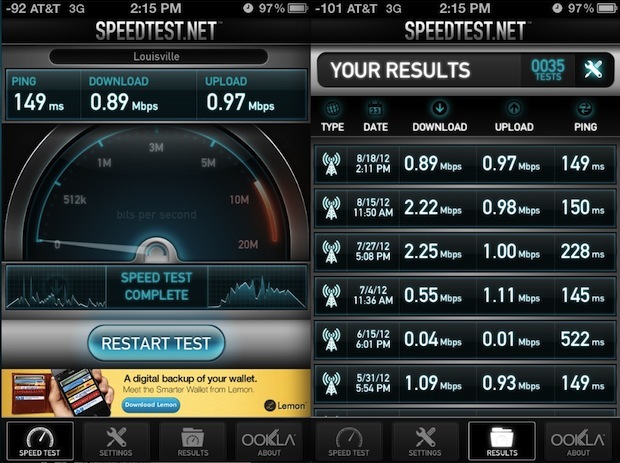 The iPhone got less than 3mbps down and even less up. AT&T service here won’t even allow a speed test because the service is so bad you cannot find a server. I like my iPhone better but you cannot rely on WiFi all the time, so I usually take the Verizon phone with me. anyone else try to swipe down on the speedometer and saw a cat…?